The Hoyer Classic Pool Lift is designed to make the swimming experience more enjoyable. It features a hydraulic-powered lifting mechanism which allows for recreational and therapeutic swimming. 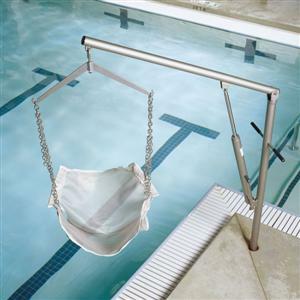 The Classic Pool Lift has a stainless-steel painted finish which is resistant to humidity and corrosion in the swimming pool environment. This versatile pool lift can be installed in one of two ways. It can be attached using the anchor plate by drilling several small holes, or by drilling one large hole and cementing a metal sleeve into place. The second method allows you to easily install and remove the pool lift at your convenience.